Home – I think – after decades where home is becomes questionable I think we are home. If we go by where the majority of our crap is that would be China but if we go by where we own our home then that is either one of two houses in upstate New York but nether of them feels like home anymore and our house in New Jersey we saw our furniture in there last week but that no longer feels like home. So perhaps Adelaide is home but this is not quite what I remember. I lived in various places in South Australia from 1981 – 2002 so this I suppose is home. My children and I lived in ten houses in ten years during 1984 – 1995, a bit of an unstable time. Australia as visiting-home; from 2002 until February 2013 we would visit for four or five weeks a year as we lived in New York then China. We even built a house in Adelaide, in Lochiel Park, that we have never lived in and our tenant has now had it for three years and we wish he would buy it. When we would visit here for the past eleven years we stayed in an apartment upstairs from Narda’s parents but they moved a couple of months ago and for the first time in Adelaide we are homeless. Narda lived here every since getting off of a boat from Holland when she was four up until teaming up with me. Now we are both homeless where we should be at home. 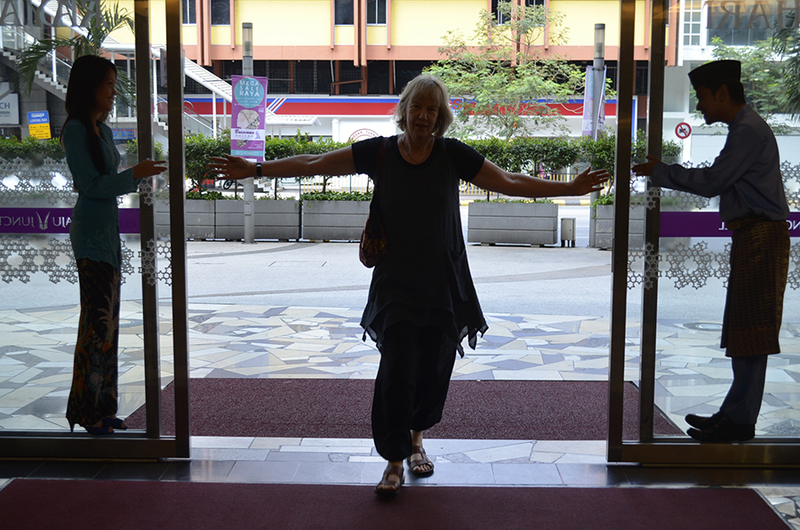 Not to worry we loved Malaysia and even managed to see a lot considering we lost one day after Malaysian Airlines canceled our flight and put us up for an extra day and night in Beijing. It was the easiest airport we have gone through anywhere in the world. Just a stamp in the passport. No stupid questions both when we arrived and when we left. Malaysia is courting old folks so perhaps that is what they think we are. 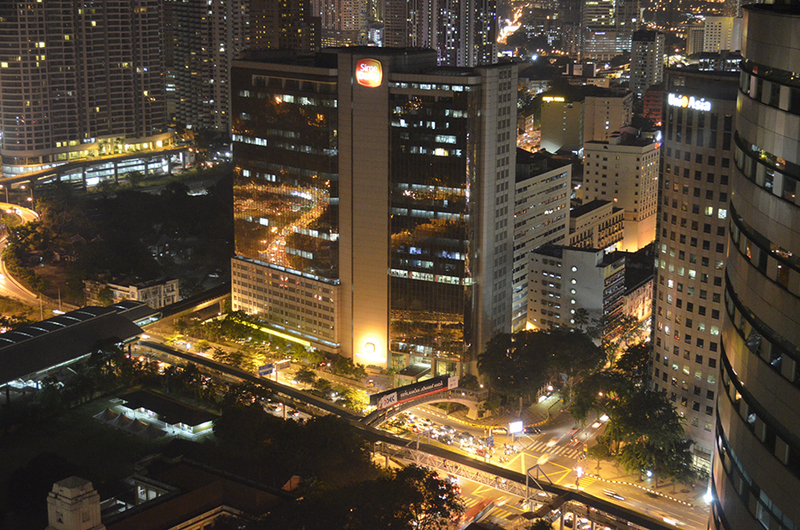 They want Westerners to retire there as long as they have three-thousand dollars a month to live on. I think that is per couple. The people are very friendly though I do admit I am at a loss to understand their belief system. I have always wondered why people believe what they do and why they are so adamant that their beliefs are the way it is. I have tried many belief systems even spent years toward becoming a priest and decades being an astrologer and basically I think they all have something to offer but none of them are really the complete system. I have taken bits and pieces from different belief systems and believe-in what makes sense to me which I suppose is what the majority of people do. Every religion is based on a leader who at the end of the day if you take away what the reality at the start of their trip was and then morph it over the centuries it is never like what everyone claims that person did or was or even still is. Perhaps humans believe in and follow someone because they are afraid to live their life without the crutch of an outside force/person/being/etc. It is easier to believe in someone who no longer or never did exist and describe it in terms of faith than to take on the responsibility for one’s own life. I blunder through life I know but I surely am not going to ask an outside non-existing being or ‘invisible’ deity for guidance. I am going to make a rational stab at going in a direction that makes sense and do what I think is best, and depend on my own past mistakes/short comings/walking-into-walls and random experiences that may or may not have been beneficial/correct/moral (as per someone else belief system). I mean do we want to believe David Icke’s trip about how reptilian people are waiting to take over the planet? I must admit I have looked at his stuff for the past couple of decades for entertainment purposes and he is a hoot, one of the world’s great comedians and even funnier are those who believe him or take him seriously. Many people are just ‘trying-it-on’ and I am sure they are just as amused that anyone takes them as true blue as I am. Below is me hanging out with Narda’s daughter-in-law. The last time we were here, six-months ago in February, Maggie would start crying every time she saw me, which I thought was just a normal female reaction to me, but this time we got along and collaborated over some technology. 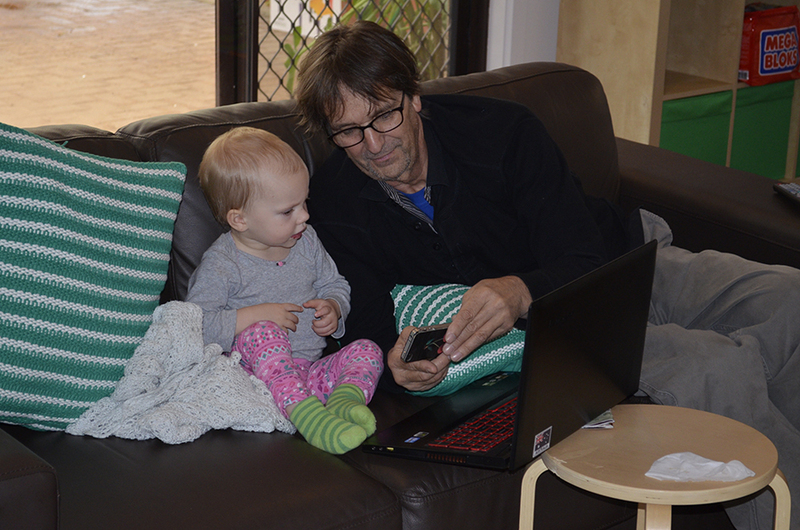 She was showing me stuff on my iPhone and I was going to show her how to make her own webpage using Creative Cloud Dreamweaver but she was not that interested which I understand a bit as she is only about 18 months old. She was even less interested in my new computer which has 16 gig-memory and all the latest bells and whistles and did I mention the whole new Adobe Suite – why would I leave the house? This was our first visit to a Muslim (65 per cent they say) country. I do like the getup folks wear and if it is not irreverent to say it is like being at a costume party with us being the ones who forgot to bring any kool looking gear. 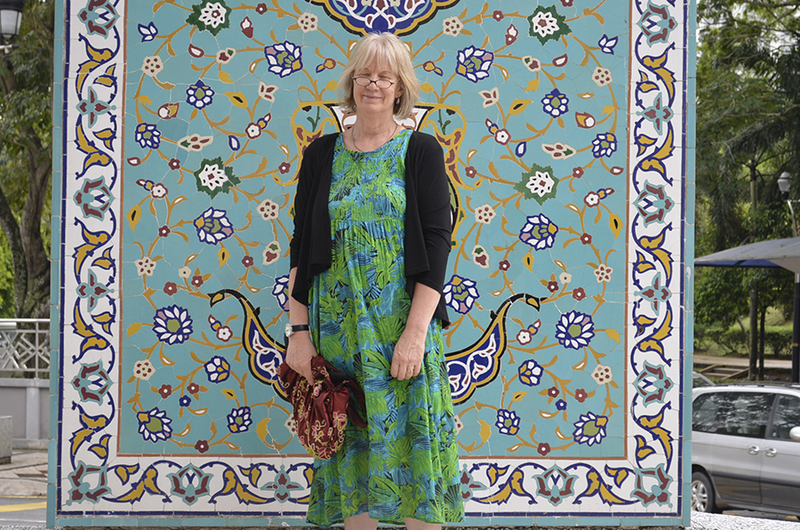 We went to the Islamic Arts Museum which was really interesting. Their art is great but after reading lots of stuff from their beliefs and looking at exhibits I really do not understand what they are on about or why they do what they do. I did come away with the feeling that they are really really pissed of at the Jews and Israel. Again, I am not a politician or know much stuff, probably really don’t know anything about anything but if their exhibits are true then Israel really did do the dirty on the Palestinians. I see there is a book to buy called ‘A brief history of Palestine for dummies‘ that I can download, perhaps that will clear up my confusion. I read one book in the museum – it was really thin – about how the Christian’s Paul was really a bad dude – I never realised how much someone disliked him. I read it because on the back cover it said that the author had studied religion and that this book described the differences between the early Christians, Paul (which the book said was pretty much a bad Jew) and the Muslim religion. After skimming through it I realised it was quite the pro-Muslim read and was not really a thesis on comparing religions. Besides the rhetoric and propaganda we did like their art. I would love to have our home – if we actually knew where our home existed – with tiles like they do. Of course they embed their verses from that book they like to read and I am not sure if I want some of those lines on the wall of my home. It is 12 RM ($3.78 US) per person to get into the museum but they only charged us 10. I thought they were being kind to us until I looked at our tickets more closely after we left and saw the word ‘senior citizen’ 10 RM at the bottom of the ticket. What? Are we that obviously old? 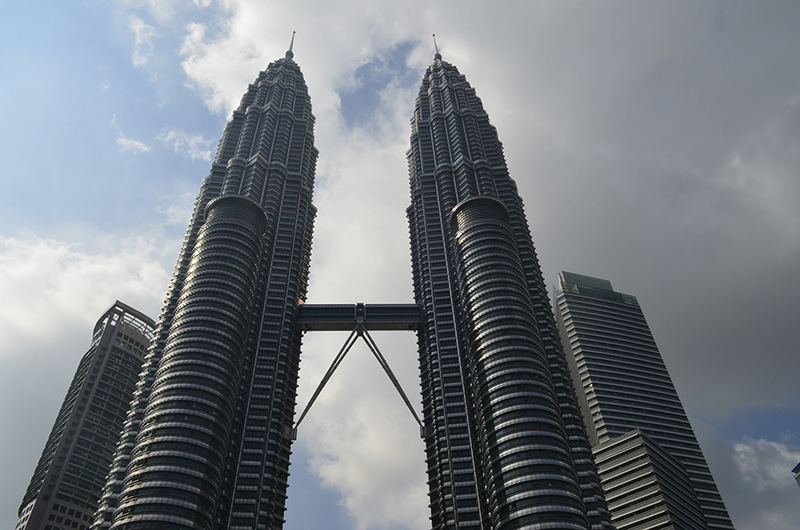 Of course the big thing to do is visit the Petronas Towers. I think I found a new thing for 911 conspirators to think about – you know how they come up with all these theories and why the New York City towers came down – well I saw tee-shirts that said ‘Petronas Towers – currently the tallest twin towers in the world’. Maybe it was not one of those many conspiracies that folks on the Internet want us to believe but in actual fact the sellers of these tee-shirts who had family members do the deed just so they could sell more tee-shirts that said they were the tallest twin towers in the world. We did make one sort of a blunder. We got lost as we do wherever we go and Narda suggested we pop into a hotel we saw right where we were lost. 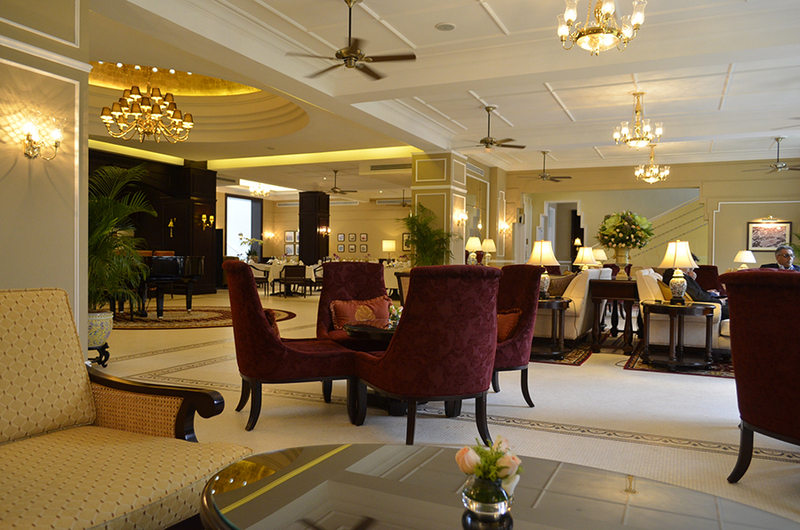 The Majestic Hotel – OK so it looked a bit old, later we learned that it was built in 1932 and I love the movie ‘The Majestic’ with Jim Carey so we went into the very fancy lobby sat down and asked for a cup of coffee. Well we were surprised at how small the cup of coffee was. It was served in fancy ornate small tea cups with a pretty little bowl with sugar. We relaxed and stopped at the bar to pay – holy cow – 45 RM which is $14.17 or to put the two cups together which still would not equal a full cup. We paid twenty-eight dollars for a cuppa. Blimey. To put that in perspective we had a full breakfast of eggs, toast, two cups of coffee and two cups of orange juice each at a our favourite Indian restaurant earlier in the day for nine dollars for the two of us. Not to worry, we just are not the classy folks that we thought/think/wish/perceive ourselves as. I suppose we should have just booked in a couple of days and eaten our meals there and forgotten about affording the rest of our trip. After that little expense we walked to Central Market and along the Historic Walk all about twenty minutes away. We got another bag of clothes with the illusion that we needed more and the hope that we could squeeze just a few more garments into our bag and once again ate our meals in Indian places at most eatery places were closed due to Ramadan fasting. 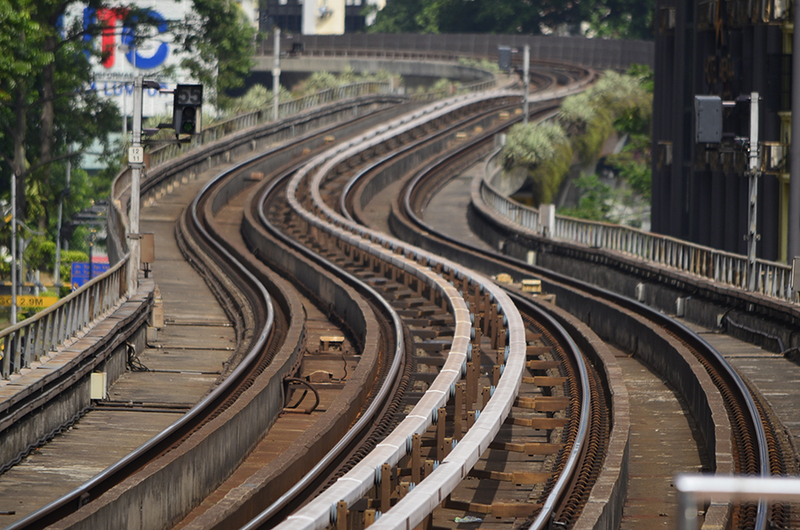 Below is a curve in the tracks in Kuala Lumpur. So here we are, Adelaide, sort of home for more than 20 years plus a visit place for another 12 years, in the midst of winter which compared to where we live in Northern China not cold at all. After the start of our mishaps with Delta Airlines (who just wrote to say they would reimburse us for the $400 we spent on ‘necessities’ due to lost luggage, – see earlier reports – so we sort of like Delta a bit and almost apologize for what I said last week how they were a crap organisation) then having Malaysian Airlines cancel our flight to KL (and their putting us up at a good hotel and paying for three meals) we did get ourselves here and it is up to us to have an enjoyable time. This will probably be my last blog until going back to China in three weeks because what would I write about? I will spend lots of time, if I have any free time, sorting out the previous couple of week’s video clips and putting them on YouTube and of course having a grand old time with Adobe Creative Cloud. I know there has been a lot of complaining about taking away purchasing programs and giving us subscriptions. 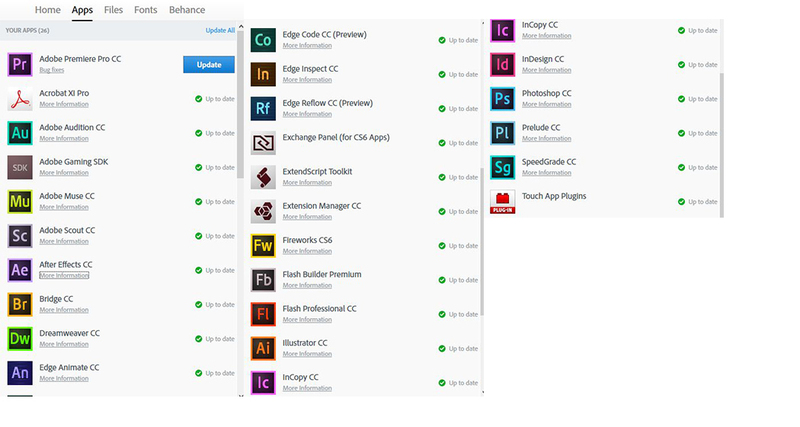 I would rather have the subscription because every month Adobe updates various bits and pieces in the 26 programs I have – some I have never used before.